After dinner, Wally took us up to the top of the A.H. Belo employee parking garage, behind the channel 8 studios, where I snapped this fantastic digitally-enhanced shot of the neon-lit STL tower and nearby office buildings. 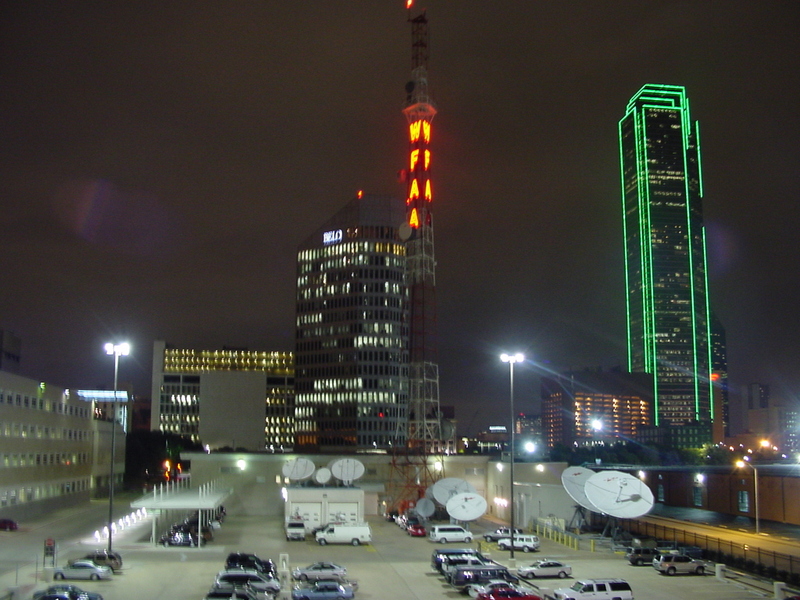 The white building out-of-frame to the left is the Dallas Morning News , which has been commonly owned with the TV station since 1950 [and, from the beginning until they were sold in the early '80s, WFAA (570) and WFAA-FM (97.9).] WFAA-TV moved here from its original studios on Harry Hines Boulevard in 1960; those studios are now occupied by public broadcaster KERA. Copyright 2002, Garrett A. Wollman. All rights reserved. Photograph taken 2002-10-10.